Overcome your fear of the spotlight . . .
Don’t you wish you could just get over it? Now you can! You will identify your self-defeating thoughts and replace them with positive expectations, gain an uplifting new attitude toward your fear, and develop the courage to stand up to your speaking challenges. In this interactive program, you’ll learn how to be poised whenever you make presentations, lead meetings, or join group discussions. Learn speaking techniques and presentation skills that will have you standing up with confidence. This program will help you identify your self-defeating thoughts and replace them with positive expectations as you learn to motivate, persuade, and hold the attention of a group. Discover 8 essential “fear busters”to improve your public speaking skills, overcome your wobbly voice, shaky hands, or pounding heart. 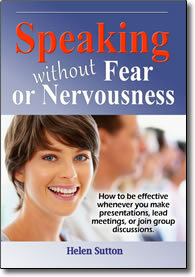 Learn to establish rapport with your group and prepare effective presentations.